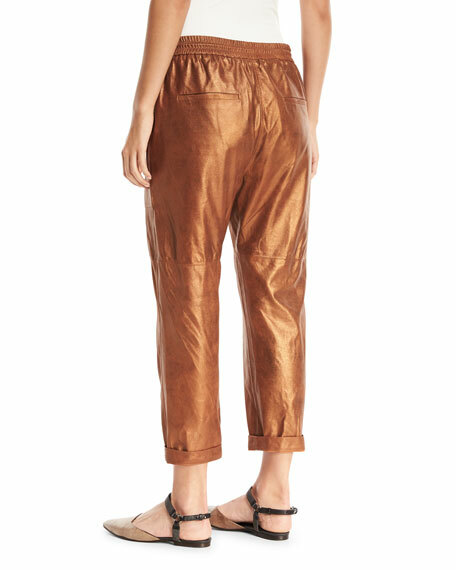 Brunello Cucinelli utility pants in metallic lamb leather. Front continental pockets; back welt pockets. Elasticized band sits below the natural waist. Dropped, relaxed rise; tapered legs. ATM Anthony Thomas Melillo pants in stretch-corduroy. Low rise; skinny-leg fit. Side welt pockets; back welt pockets. Cropped above ankles. ATM Anthony Thomas Melillo pants in stretch-corduroy. Low rise; skinny-leg fit. Side welt pockets; back welt pockets. Cropped above ankles. Extended button-tab/zip fly. Cotton/spandex. Machine wash. Imported. Model's measurements: Height 5'10"/177cm, bust 33"/84cm, waist 25.6"/65.2cm, hips 35.8"/91cm, dress size US 2-4/FR 34-36. Brunello Cucinelli trousers in linen houndstooth Glen check. Side slant pockets; back welt pockets. High, contoured waist with back notch. Brunello Cucinelli trousers in linen houndstooth Glen check. Side slant pockets; back welt pockets. High, contoured waist with back notch. Straight, cuffed legs. Front zip; belt loops. Polyester/acetate/cupro lining. Made in Italy. Model's measurements: Height 5'10"/177cm, bust 32"/81cm, waist 24"/61cm, hips 35"88cm, dress size US 2/4. 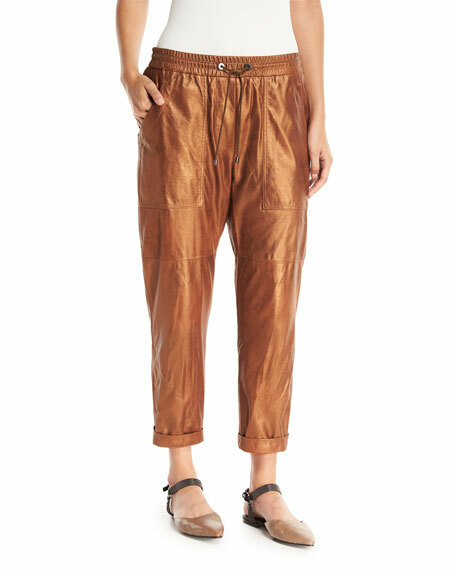 EXCLUSIVELY AT NEIMAN MARCUS Brunello Cucinelli felpa jogger pants. Natural rise; monili stripe drawstring. Side slip pockets. Relaxed fit. Tapered legs. Pull-on style. Rolled cuffs. Cashmere/cotton. Lining, polyester. Made in Italy. Model's measurements: Height 5'10"/177cm, bust 31"/79cm, waist 24"/61cm, hips 34"/86cm, dress size US 0/2. Brunello Cucinelli pants in metallic plaid wool flannel. High-rise; belt loops. Concealed zip fly. Side slip pockets; back besom pockets. Brunello Cucinelli pants in metallic plaid wool flannel. High-rise; belt loops. Concealed zip fly. Side slip pockets; back besom pockets. Relaxed fit. Straight legs. Cuffed hem. Cropped at ankles. Wool/spandex/polyester. Made in Italy. Model's measurements: Height 5'10"/177cm, bust 33"/84cm, waist 25.6"/65.2cm, hips 35.8"/91cm, dress size US 2-4/FR 34-36.